If you know you me well enough then you will know that when I first entered Syracuse University as a freshmen, my major was History. It was one of the few things that I was really good at in high school. I loved it and understood it. History was not just about dates but more about the events and how things occurred in the past that might effect our present day. So when I really started getting into history when I was in college, I was shocked by a very disturbing fact, I was learning about His Story. History is always written by the winner in most cases. What bothered me the most was what I did not learn in high school. The thing that comes to mind the most was the Transatlantic Slave Trade. While, I knew about it in high school, it was never presented in the same way as it was in college. That always stuck with me, so I decided to talk courses in African American history. Once I got a different perspective on history, I dropped the major and switched to English. However, I still wanted to know more about my history. At that time, there wasn’t a Latin American Studies program but you could navigate certain classes to learn about the Caribbean and South America and I made sure that I did that. I bring this up for 2 reasons. The first being that I was speaking to one of my students, who is Latina, about know her history. I have no problem explaining how the slave trade impacted the Caribbean. I have no problem explaining how Europeans killed most of the indigenous population, raped the survivors, and then replaced the workforce with African slaves. Most of this information cannot be found in history books at the high school level. What I do have an issue with is people not knowing icons. The second reason is really simple. February is coming soon and that means Black History Month will be upon us. As usual, most Latinos think they they have no contributions to this month and that is the farthest from the truth. I have a Wheaties Box in office. Yes it is there, unopened. 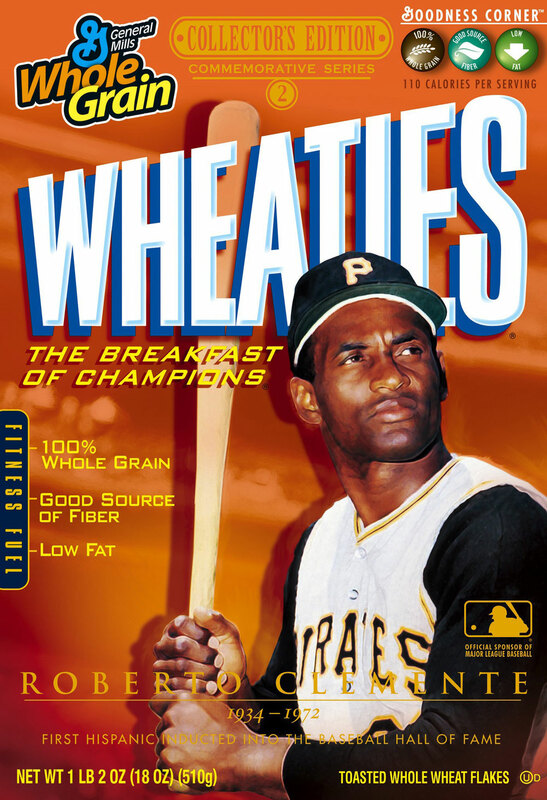 The person on that box is Roberto Clemente. Maybe it is just me, but I feel that all Puerto Ricans should know who he is. What bothers me is the ignorance. I have been asked, “why haven’t you eaten the cereal?” I like how certain people scoff as if it is disgusting to have an old box of cereal. I always have this puzzled look as I think to myself that all they see is a box of cereal and not the person who is on the box. Why is that? Because they do not know their history. Conservatives in Texas do not care if you never know your history. Clearly they believe that they can remove people like Cesar Chavez from the history books because he lacks “lacks the stature…and contributions.” Which basically tells me that they are just looking at the Wheaties box and not understanding that history cannot just be rewritten by the “winner”. It very much like how the MTA in New York City wants to remove free transportation for students. The less people who know their history, the more control the powers that be have. Make no mistake that racism is still alive. So, my question to you. Do you know your history? Or are you faking the funk? The way to understand everything that is going on in this world, from Islamic Extremists to Gay Marriages, is to know the history behind them. Perhaps more perspective will be gained by everyone. Indeed bredren . . .indeed! No matter what is happening now, it all comes from a series of what happened! It is said,” A person without a past, doesn't have a future!” History is memory! Without it, there isn't any feedback for improvements going forward. To learn 'Our-Story' one has to be be willing to do the research and footwork. Unfortunately, there has always been an attempt at ignoring the contributions made by people of Black and Latino descent. It not so much whether their contributions were big or small it is also a matter of reflection. It is a great disservice when children don't see historical figures that reflect them. Once again, it is left to us to teach our children 'Our-History' and if as adults/parents we don't know then we set the cycle of losing that part of history. Peace.